We beat Castle Panic for the first time. Castle Panic is a board game where the players work cooperatively to defend a castle from a horde of attacking monsters. The last monster, in the castle ring. The monster onslaught is randomized by having the players blindly choose monster tokens to be added into play. There are a few special effect tokens which can make the horde so overwhelming that the game is over in a few rounds. We’ve been frustrated several times, but we finally got lucky tonight. It’s a really fun game. It’s exciting in a different way: it is a teamwork focused strategy. 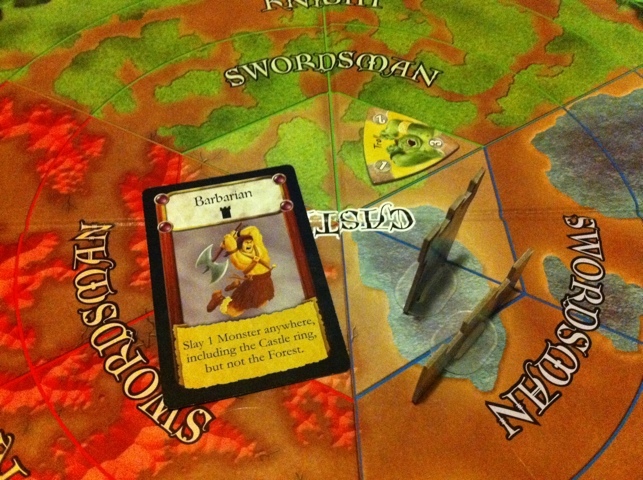 Players need to plan trading resources so that the game can continue. But there is competition; the player who slays a beastie keeps it’s token – which is added up for a score at the end. Interview with Justin De Witt, creator of Castle Panic.